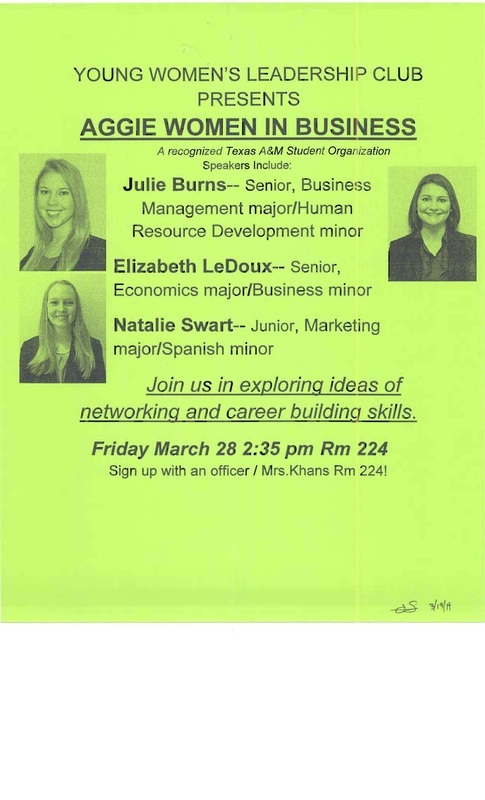 Young Women's Leadership Club present Aggie Women in Business on Friday, March 28th at 2:35 in 224. Sign up with an officer or in Mrs. Khan's room. Join us in exploring ideas of networking and career building skills. Speakers form Aggie Women in Business -- a recognized Texas A&M student organization -- include Julie Burns -- Senior, Business Management major/Human Resource Development minor; Elizabeth LeDoux -- Senior, Economics major/Business minor; and Natalie Swart -- Junior, Marketing major/Spanish minor. Drop off jeans for homeless youth in our community through Feb. 12th to front office or room 224. Please join Young Women’s Leadership Club in collecting jeans for youth in our community. One (1) out of three (3) people are experiencing homelessness under the age of 18. •Our drive is now until February 12th. •Drop off locations are in the Front Office or Room #224. Young Women’s Leadership will meet Fri., Jan. 17th, in Room 224 after school. We will discuss student loans. Young Women’s Leadership meeting on Thursday, December 5th, at 2:45pm in Room #224. Please attend! !